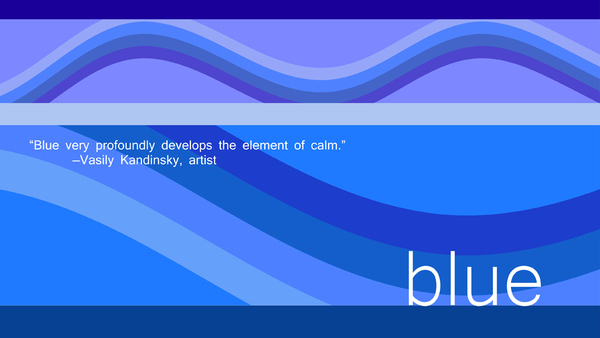 over the last few years i have incorporated more and more of the color blue into the chalet design. there was a starting point and it was this shower curtain. i love stripes - man do i - i have more than a few Boden Breton t-shirts. i remember working on a piece like this in my high school art class. the pattern the color - it conveys so much in it's simplicity of form. my childhood bedroom which i originally shared with my older sister was yellow for years; it had - green curtains and pair of kelly green bedspreads with a small white floral pattern; then in my Laura Ashley phase the walls became white - accented with blue and pink patterned bedding and lastly it was this lovely blue. 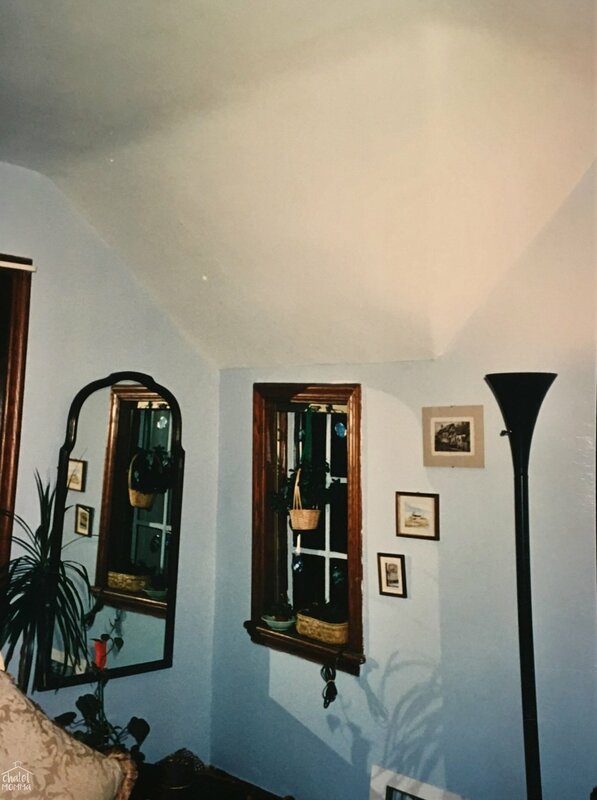 i was looking through albums and i'm bummed there aren't more images of the room i called home for more than half my life. you can see i had a bit of art and had already started my @saynotoemptywalls obsession - two of these pieces are hanging upstairs in the chalet and the smallest is my treasured pen and ink of Edinburgh mom brought back for me from her trip. oh look at the plants - i miss those wide English Tudor window sills. these scrumptious Hedgehouse headboard cushions were the catalyst for introducing blue in the master. these pillows are life-changing. i can't tell you how much like royalty they make you feel. the marvelous linen fabric is dreamy and the down feathers extremely heavy and dense - they are amazingly supportive and the tassel ... so fun!!! you need these in your life! then i started in the livingroom. the couch and carpets give off a taupe vibe, (ok very taupe) but i do love them and i'm not sure what i'd do if i could scrap them - which i can not currently.... a blue couch? maybe... different rugs maybe? in my piece style love you saw a pattern: the designer's spaces i'm loving have an airy quality usually light colored accented with blue. not exactly the same sort of feeling as the chalet. but, that is exactly why i really like them... it's the opposite of the what i live with. i have this mid-century modern all white walls and dark sectional thing floating around in my head for the basement re-do (whenever that happens). this Target striped blanket was a fun addition. it's 100% cotton with fringe. i spy it so often all over IG and in the blogosphere. this image... the corner of the mantel from last spring. this was when the blue light-bulb really clicked for me - i gathered images from Jane at Home, The Pink Clutch, Sue De Chiara and Pencil and Paper Co. and used their inspiration to pull this together. i let my blue flag fly on the porch just look at it all! don't you adore the faux fur footstool i picked up recently at Home Goods. it was just what the porch needed a bit of whimsy - and honestly i have been sitting on it working on my puzzle - it's comfy too! yes, i am an orange enthusiast, but give me navy all day long! my recent trip to Home Goods yielded all these goodies! the new throw has found a home on the back of the beige velvet chair in the livingroom and for the first time in the kitchen i swapped out my regular orange dishtowels for some blue love. not sure why i waited so long. my current obsession is this vintage chinese vase. i just started using it for flowers. isn't it great! sometimes it's not just about what we live with in our homes, but seeing the color around us and finding joy - that's why i titled this piece indigo dreams. the rose window in the Basilica of the Scared Heart in Newark NJ - stunning. what is your favorite color? do you incorporate it into your decor?